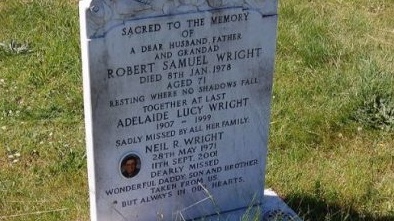 IN A FAR corner of a cemetery in Chadwell St Mary lies the grave of Neil Robin Wright. The 30-year-old options broker from Tilbury, died on September 11th, 2001 in the Twin Towers. Neil worked for the global financial services company Cantor Fitzgerald. The company were based between the 101st and 104th of the north tower. They lost 658 employees, more than any other organisation in the terrorist attacks. Cantor Fitzgerald host a website where people can pay tribute to the employees murdered by the attack masterminded by Osama Bin Laden. “Throughout secondary school his aptitude for maths and a personality that was to ensure his success in life were so apparent. Headteacher had a soft spot for Neil often forgiving him for misdemeanours, having faith that he would succeed in life whatever. “The work experience at Barclays Bank was to be instrumental in shaping his future in the world of finance. At 16, Neil landed his first job in the City of London at Barclays Bank. He worked hard and played hard too! Evenings were often spent with friends drinking in one of the many bars (some things never changed). From Barclays, to Marshalls and then Cantor Fitzgerald, nothing would stop Neil going up the ladder”. On this day we always pay tribute to a young man from Tilbury, who followed his dreams and headed west only to be struck down in the prime of his life. In 2011, our editor made this short film at the Ground Zero monument where Neil’s name is written. One Response to "9/11: Tribute to Thurrock man who died in New York terrorist attack"